Matthew 25:1-4 "Then shall the kingdom of heaven be likened unto ten virgins, which took their lamps, and went forth to meet the bride-groom. And five of them were wise, and five were foolish. They that were foolish took their lamps, and took no oil with them: But the wise took oil in their vessels with their lamps." The parable tells us about the "kingdom of heaven", that is God's kingdom on earth, i.e. the Church. In the last days it will experience a preparation for Jesus' return as Bridegroom of His Church. Everywhere will be heard the cry "Maranatha, Jesus is coming back!" This coming of the Lord Jesus as Bridegroom of the Churchbride is not His visible return on the clouds of heaven, for this return unto the establishment of the Millennium of Peace will only take place after the anti-christian period. This return will be invisible in and by the Holy Spirit. Scripture promises us great things when the Spirit of Jesus Christ has been able to adopt us as members of the Bride of the Lamb, has been able to add us to the spiritual body of the Bride of the Lamb of God. 1. He then will make us blameless, without spot or wrinkle, and holy. Ephesians 5:25-27 "...as Christ loved the church, and gave himself for it; That he might sanctify and cleanse it with the washing of water by the word, That he might present it to himself a glorious church, not having spot, or wrinkle, or any such thing; but that it should be holy and without blemish." 2. This state of holiness, into which the Spirit of Jesus Christ will bring that part of the Church chosen hereunto in the last days, will cause them to escape the grave as they then have become sinless; for people die because they are sinners. James 1:15 "Then when lust hath conceived, it bringeth forth sin: and sin, when it is finished, bringeth forth death." 3. Besides the putting on of great divine glory and strength. But there are wise ones and fools in the Church of the last days. The wise ones, half of the Church, take with them, besides oil in their lamps (for it is a time of spiritual darkness) also oil in their vessels, namely in their hearts. Oil is the type of the Holy Spirit. Taking oil in the vessel, in the heart, spiritually means: preparing oneself for sanctification; the foolish do not do this. They do wash their sins in the blood of the Lamb, and because of this they have become virgins; but they do not seek sanctification and continue to lead worldly lives. In this time the opposing satanic power puts the Church into a spiritual sleep. Matthew 25:5 "While the bridegroom tarried, they all slumbered and slept." 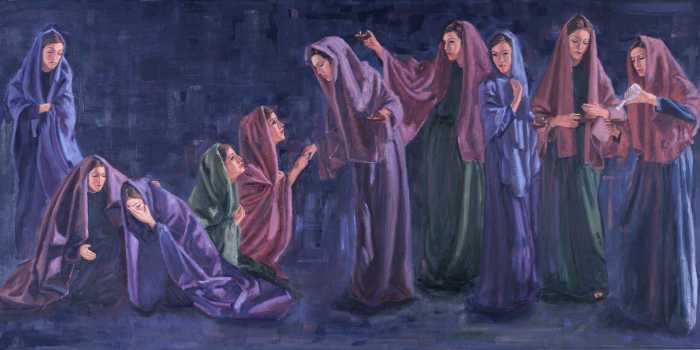 The prophecy of Jesus Christ reads: "They all slumbered, the wise… and the foolish virgins, and fell asleep!" And if anyone should know this, Who better than Jesus Christ, the Divine Word of God Himself. Joel, too, prophesied this spiritual sleep of the Church for the end-times, and of the Church's "locusts" because of the slumbering sin and tolerance due to the spiritual sleep (Joel 1). Ephesians 5:14-18 "Wherefore he saith, Awake thou that sleepest, and arise from the dead, and Christ shall give thee light. See then that ye walk circumspectly, not as fools, but as wise, Redeeming the time, because the days are evil. Wherefore be ye not unwise, but understanding what the will of the Lord is. And be not drunk with wine, wherein is excess; but be filled with the Spirit (of Jesus Christ)." The Word says "Arise from the dead", wake from the sleep of sin, be delivered from the bonds of your sins by the power of Jesus Christ, and by His blood; and be filled with His redeeming Spirit, with His resurrection power. Matthew 25:6-7 "And at midnight there was a cry made, Behold, the bridegroom cometh; go ye out to meet him. Then all those virgins arose, and trimmed their lamps." This voice that calls out "Go out to meet Him" (Matthew 25:6) means, that we are to rise up from the sleep of death by God's grace, and that we must let His Holy Spirit prepare our hearts and lives for His invisible return as Bridegroom, that He might prepare us for the marriage, and make us blameless, without spot or wrinkle (Ephesians 5:27). This call of the Spirit will cause a general reveille (awakening). Matthew 25:7 "Then all those virgins arose, and trimmed their lamps." They all prepared spiritually for the coming of the Bridegroom, but we read in this prophecy that only half, the wise part, will be adopted as members of the Bride of Lamb, because only they will reach the state of spotlessness. A child of God once had a vision of an colossal giant. He was lying on the earth and was bound with many worldly bonds of sin by the powers of darkness, and was powerless to get up. The visionary saw, that he stretch out first one hand, then both hands, to heaven in a cry for help to God. He then received strength and slowly stood up, while the powers of darkness around him fled. He then beat off the dust and the glory of the Lord fell upon him. He did this in obedience to God's call. "Write, Blessed are they which are called unto the marriage supper of the Lamb... These are the true sayings of God." Partaking (in the spirit) of the supper of the Marriage of the Lamb is sharing the death and resurrection of the Lamb of God, that we might take part in the marriage of the Lamb of God, being without spot or wrinkle. This call to participation is personal and one may hear it sooner than the other. We also see in the prophecy of the prophet Daniel in Daniel 2:31-35 and 44-45 that complete deliverance of the power of sin takes place personally and gradually, namely in the time of the ten kings of the restored Roman Empire (the ten toes of Nebuchadnezzar's statue), in the time of the ten kings of Revelation 17:12-13. Daniel 2:31-35, 44-45 "Thou, O king, sawest, and behold a great image. This great image, whose brightness was excellent, stood before thee; and the form thereof was terrible. This image's head was of fine gold, his breast and his arms of silver, his belly and his thighs of brass, His legs of iron, his feet part of iron and part of clay. Thou sawest till that a stone was cut out without hands, which smote the image upon his feet that were of iron and clay, and brake them to pieces. Then was the iron, the clay, the brass, the silver, and the gold, broken to pieces together, and became like the chaff of the summer threshingfloors; and the wind carried them away, that no place was found for them: and the stone that smote the image became a great mountain, and filled the whole earth. And in the days of these kings shall the God of heaven set up a kingdom (God's Kingdom on earth), which shall never be destroyed: and the kingdom shall not be left to other people (except to God's people, His divine Israel), but it shall break in pieces and consume all these kingdoms, and it shall stand for ever. Forasmuch as thou sawest that the stone was cut out of the mountain (of sin) without hands, and that it brake in pieces the iron, the brass, the clay, the silver, and the gold; the great God hath made known to the king what shall come to pass hereafter: and the dream is certain, and the interpretation thereof sure." Here one stone is loosed, cut off, completely delivered from sin, from the mountain of sin without hands (without human help). Some think that this one stone is the Lord Jesus Christ, but this is a wrong interpretation, because Jesus Christ, in His life on earth, was never bound to the mountain of sin; moreover, this is an event of the end-time, of the time of the ten kings. Thus, this stone has to be a sinner from the end-time, who by his faith in the finished work and in the power of Jesus Redeemer, is brought in Jesus' victory; thus overcoming satan and his power of sin, whose heart is cleansed of the chaff of the old person; whereafter he by the power of the Word shares this victory with many others: a mountain of completely delivered Christians, without spot or wrinkle: the Bride of the Lamb of God. Revelation 12:11 "And they (the victors) overcame him (satan and power of sin) by the blood of the Lamb, and by the word of their testimony (whereby also others will share this victory); and they loved not their (earthly, sinful) lives unto the death (until it is completely dead, already here on earth; so that they may live without spot or wrinkle, faultless; see Ephesians 5:27, already here on earth)." CLICK HERE if you want to read the rest of this study – that is to long for the Blog. (Note: verses 1-16 have already been studied in Chapter 5 - see our Blog on March 10th). 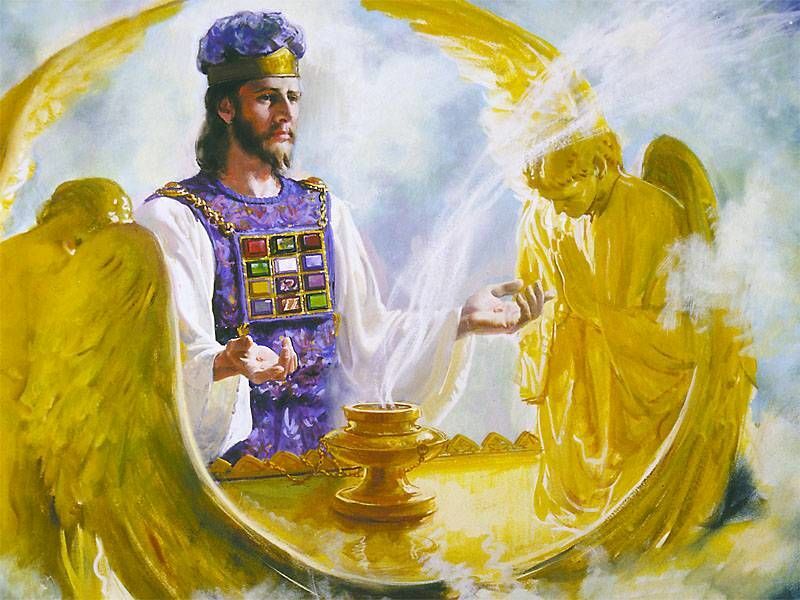 As we have already shown: God is going to establish a kingdom of priests. Each one in this kingdom will be a priest for another person. A priest who hands out God's gracious blessings to another; who intercedes with God for that other person; and who lives before God's face in honor and praise and thanksgiving. Because of a greater devotion and a more faithful dedication to God, the one priest will receive, through grace, a place closer to God than another priest. Because of this he will receive more gracious blessings from God, and passes those on to others. One sees, that therefore in this wonderful Kingdom of God, the highest placed person – this is the one closest to God – will be everybody's servant. "But Jesus called them to him, and saith unto them, Ye know that they which are accounted to rule over the Gentiles exercise lordship over them; and their great ones exercise authority upon them. But so shall it not be among you: but whosoever will be great among you, shall be your minister: And whosoever of you will be the chiefest, shall be servant of all. For even the Son of man came not to be ministered unto, but to minister, and to give his life a ransom for many" (Mark 10:42-45). From high to low God's Kingdom therefore consists of priests. The one regards and prays for the other. Intercession for another is a priestly job. At the head of this Kingdom is the High Priest, our Lord Jesus Christ, Who forms the Source of all God's blessings and allocations (here: gifts, ministries, etc.). In intercession, the priests are to bring the needs of the people to the High Priest, to God. And in their turn they hand out the blessings they have received from the High Priest-God to others. Well then, everyone is doing priestly work, and thus is a priest; but he also is more or less a king, because he is a child of the great King. All are children of God, but there are princes (here: rulers) among God's children, who, because they are closer to God by their priestly function, are better "media", namely spiritual channels with a pure reception and passing-on of God's wonderful blessings and provisions. Luke 6 verse 17-19: "And he came down with them, and stood in the plain, and the company of his disciples, and a great multitude of people out of all Judea and Jerusalem, and from the sea coast of Tyre and Sidon, which came to hear him, and to be healed of their diseases; And they that were vexed with unclean spirits: and they were healed. And the whole multitude sought to touch him: for there went virtue out of him, and healed them all." Here one sees again Jesus' distributing power of grace. Virtue went out of Him. Sometimes He gave that power to the apostles and emissaries, and they in turn gave of it to the people. We see the same picture at the multiplication of the loaves. He handed out the bread and the fish, after having blessed and broken them, to His apostles, and they distributed them to the people. In the texts of this Gospel a "level place" is mentioned. In the corresponding text of the Gospel after Matthew we know, that He then stood on a mountain. Hence it must have been a mountain plateau. There He addressed a large multitude. Let us dwell on this for a moment. At several occasions He addressed a crowd of thousands of people. At the first multiplication of the loaves He spoke to 5,000 men; not counting women and children. The second time the number of people was 4,000 (Matthew 14:13-21; 15:29-39). Yet everyone could hear Him clearly, although He had no microphone and amplifier at His disposal. Do not we see here the majesty of God, and His mastery over the laws of nature? Here we see one of the Holy Spirit's gifts revealed; namely that of power. The same gift was revealed (and clearly seen) when He walked over the Sea of Tiberias; also when He calmed the storm there. This gift, which Jesus possessed in all fullness, He also wants to give to His children, anywhere the gift is needed for the increase of His Kingdom and for the glorification (and thus the proclamation) of His Name. I. The attitude of the priest towards God. Luke 6 verse 20-26: "And he lifted up his eyes on his disciples, and said, Blessed be ye poor: for yours is the kingdom of God. Blessed are ye that hunger now: for ye shall be filled. Blessed are ye that weep now: for ye shall laugh. Blessed are ye, when men shall hate you, and when they shall separate you from their company, and shall reproach you, and cast out your name as evil, for the Son of man's sake. Rejoice ye in that day, and leap for joy: for, behold, your reward is great in heaven: for in the like manner did their (fore)fathers unto the prophets. But woe unto you that are rich! for ye have received your consolation (see also Luke 16:25). Woe unto you that are full! for ye shall hunger. Woe unto you that laugh now! for ye shall mourn and weep. Woe unto you, when all men shall speak well of you! for so did their (fore)fathers to the false prophets." We learn here how the attitude of the priest and child of God must be towards his God and Father, in spite of the sinful people around him. In the verses 20-21 there is mention of a "Lazarus attitude". Surely you heard the parable of Lazarus and the rich man (Luke 16:19-31). Lazarus was poor; he begged and asked. Anyone would understand that this is meant spiritually, and not literally: not every poor beggar goes to heaven, and not every rich man goes to hell. On the face of it this seems to be expressed in this parable. But the Holy Spirit refers here to the "Lazarus attitude", and the "rich man's attitude" of our heart. I already stated that the first two texts of this part of the bible renders the "Lazarus attitude" of the heart of a good servant of God; while the verses 24-26 render the "rich man's attitude" of the heart of a bad servant of God. This last (inner) attitude is caused by that feeling of self-satisfaction, which is sinful in God's eyes; that feeling of being more righteous and holier than other sinners; a feeling that the Pharisee had towards the tax collector (Luke 18:9-14). Spiritually seen the rich man brought a rich meal on the table. The ones that were invited admired his wealth and generosity; and the rich man felt flattered by that admiration which he was after. But Lazarus was conscious of the wounds of his soul, and his sins, and of his spiritual poverty. Someone with a "Lazarus attitude" soon will pray: "Lord, have mercy on me, a sinner!" And he begs God for food, for spiritual food. A person with such an inner attitude will be saved by God; he will receive grace. However, a servant with a "rich man's attitude", someone who pretends to be one rich inwardly, is doomed (condemned to hell) by God. Why? Because he is proud of his self-righteousness, which means that he never really had any part in God and Jesus Christ. A true servant of God will always have a "Lazarus attitude"; his heart will always sincerely long for grace and for the full relationship with that great God. In his life there will be moments of great (spiritual) refreshment, but these will be followed by periods of great (spiritual) hunger and thirst for God! This great (spiritual) hunger and thirst will always mark the true child of God. These "poor in spirit" will have the Kingdom of God within themselves and will inherit it. One poor in spirit will always ask, and will always open his heart to receive grace. But in order to receive, he must be able to give himself to God from the heart; that the Lord God, through Jesus Christ, may completely change (renew) his carnal thinking and inner being by His Word and the Holy Spirit, to NEW LIFE, after His will. He must be able to do this after His will and not after ours. The prayer, deep in the heart of such a child of God is: "Break me, make me, mould me completely after Your will, O God!" In accordance with that inner hunger and thirst, God will satisfy His hungry and thirsty child with His justice, His love, and His blessings; and will use him for priestly labor for others by means of His anointing of Spiritual power. If you have the right spiritual attitude that spiritual hunger should be present any moment of the day; then God will give His manna (spiritual food) also each day again; not once for all, but each day anew; a new portion for that day. And the next day the hunger will be there again, which must be satisfied by God. Seen in this light, our morning prayers therefore are so important. For we are to receive through these prayers: new manna; new strength to walk the way of victory that day; to go from grace to grace; to walk with Jesus! In verses 22 and 23 we are shown the hatred satan has towards those with a "Lazarus attitude". Satan reveals this through worldly people, but also through the unconverted and partly converted Christian. They will reject you; will separate themselves from you; they will call you a "goody two shoes". They know you do not belong with them in your thinking and feelings. Your presence alone in their midst condemns their actions, walk and speech; therefore people in society, in your office or in the factory do not like you. They want nothing to do with you. But why should we fear? The Lord overcame the world! And He has the last word! He will keep you in His omnipotence as long as He can maintain you as His child. And if the Lord has not preserved us, then something might be wrong with our kinship, and we should examine ourselves in the light of His Word. In verses 24-26 we read about that "rich man's attitude". Such people are praised by the world (read: satan). Between the lines of verses 25 and 26 we can hear satan laugh and praise such people, saying: "Good on you, boy, you are headed the right way!" The worldly men agree with this, and one hears them say: "You are a wonderful person, just and good and very praiseworthy!" Beloved, if this is happening to you, then mostly something is wrong with you! We read in this Scripture part about the "Lazarus" and the "rich man's attitude"; about the attitude we are to have before God. I pray God that you may always have this "Lazarus attitude"; the attitude of the "poor in spirit", that God may give you His rich gracious blessings. CLICK HERE if you want to read this study (Chapter 6) – that is to long for the Blog.